I am horrible at meal planing. The weeks I do plan, we NEVER and I mean NEVER stay on them. Something always comes up, work wise or my family just isn' "feeling" the particular meal that day. It really is a challenge. The last thing I want to deal with at 5:15/5:30 when I get home is trying to figure out what to make for dinner. My amazing husband has been doing much of the cooking the last few months. I am very grateful to him for that, and I have been trying to get back on the wagon. I am so exhausted when I get home from work, and on the days I'm home from chasing after my rambunctious toddler. I desperately need QUICK and EASY dinners that don't come out of a box. Every recipe I have found, isn't as quick and easy as it claims, nor is it something that my husband is fond of. It is something I have struggled with during our marriage. He would rather just eat ramen, hamburger helper, and mac and cheese. Our family needs more recipes, that are simple and easy. Any suggestions? What are your favorite family meals? I made a trip to Ikea recently to try and find a few decorative touches to place around my home. I love Ikea, it has amazing items for your home that are cheap. While I will never achieve the perfection they have in their store, I love wandering and getting ideas for things I can place in my own home. This was one of them. I purchased a plate, rocks and a circular candle, and turned it into a fun piece. A quick and easy thing to add to your home. You can do this type of thing with any of your own objects that you may already have around your home. Perhaps you have some seashells, an old platter and a candle to do something similar with? The options are endless. 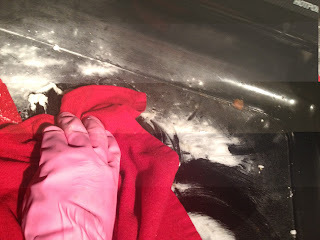 Allow the cloth to soak for a few minutes and cover the stove top with baking soda, then wring out the towel so that it is damp, but not soaked, and lay it over the entire stove top. 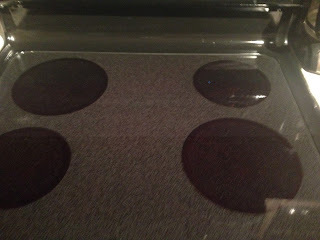 Then comes the best part, set the timer for 15 minutes, and walk away. Thats right, put your feet up, (or deal with the pile of dishes you have been ignoring) and let the baking soda do its magic. 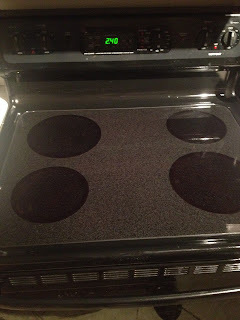 When the timer goes off, use the towel to wipe (maybe a little scrubbing) and shine your stove top. 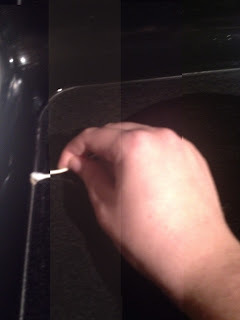 I had baking soda in the crevasses when I was done, so I just used a q-tip to clean it up really quick. And VOILA! 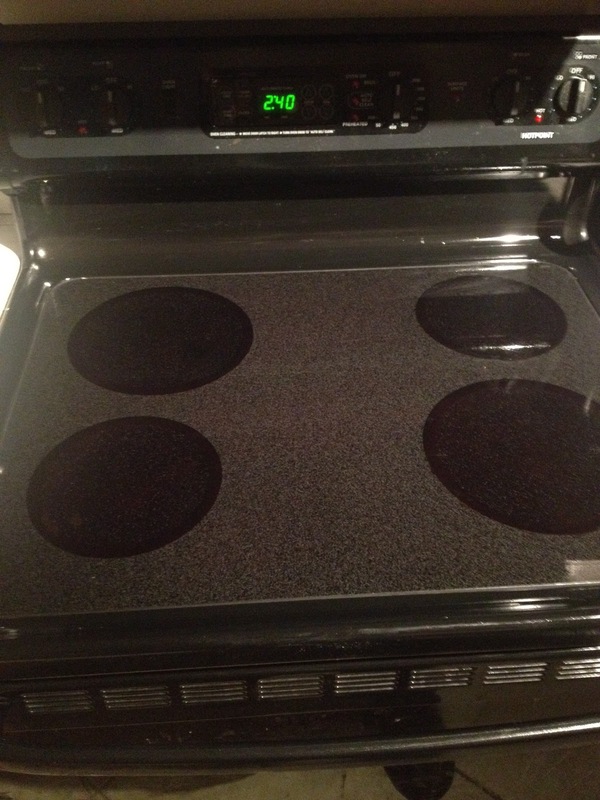 Your stove top looks shiny, and AMAZING. Just look at this! Isn't it so pretty!!! 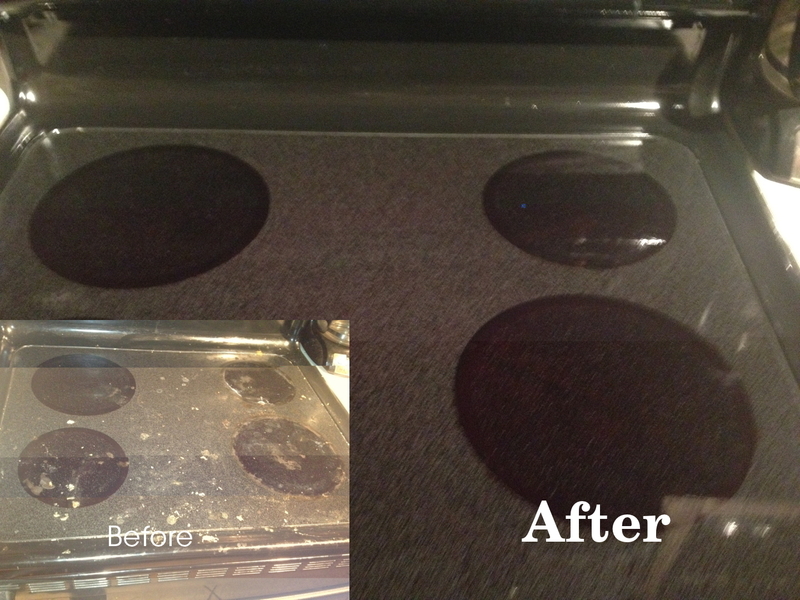 I promise this took less work than any commercial cleaner I have used, and had much better results! Hope that this will help you all in your home cleaning! 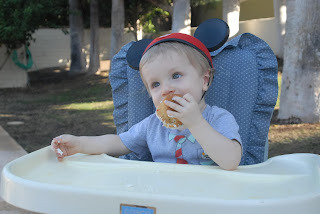 For my son's 1st birthday, we chose a Mickey Mouse theme for his birthday party. Honestly I had TONS of super cute ideas, but I ran out of time at the last minute. I did manage to make some things happen and it was nice to have family and a few friends celebrate with us. Here is the table. On it is Max's 1st mickey hat, a picture from each month he has been with us, as well as other miscellaneous small Mickey favors, and the food. It was all on a Mickey table cloth that we picked up at Toy's R Us. 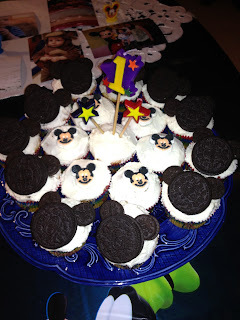 As you can see I used 2 mini and one regular Oreo to top some of the cupcakes with Mickey ears. I also purchased some Mickey candy toppers, and found a fun #1 candle at the dollar store that fit the theme. I also used a Mickey cookie cutter to shape some rice krispy treats. They were a big hit! I also had veggies, just so that there were some healthy options. That was the extent of the decorations. There were a few other Micky nicknacks around, but I don't have any good pictures of them. Finally a picture of the birthday boy and his 1st cake. Hope you enjoyed! If you are looking for some more great Mickey Birthday ideas, check out my Pintrest board dedicated just to Mickey Birthday stuff, just click here! This is my new favorite slow cooker recipe. 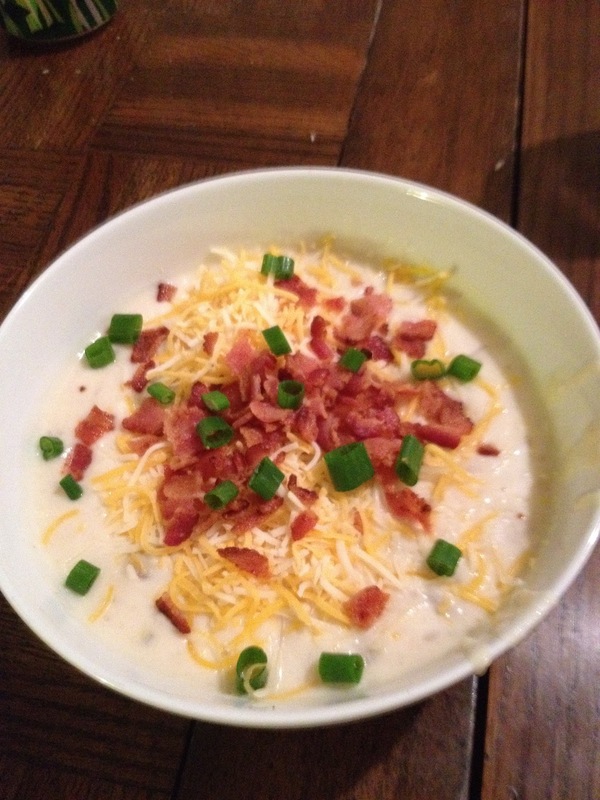 It is so yummy and on top of that, it makes a TON of potato soup and it freezes perfectly! You will also need 5lbs of potatoes. Yes, I measured them on a bathroom scale. No, I don't have a kitchen scale. This is my favorite step, they are slow cooker liners. Litterally all you have to do is put this in before, and then for clean up, just toss it. I know, its so not green, but I REALLY hate scrubbing out my crock pot, which is why I never use it. With this, I may though. Also, add 8 cups of chicken broth, and let it cook on high for 6 hours. This is where I am a horrible blogger, as I forgot to take pictures of this next part because I needed to feed my starving hubby and son. But, you take out and chop up the garlic cloves and return them to the pot. Then add 16oz of cream cheese. To help mix it better, I soften and chop the cream cheese, as well as put some of the soup mixture in a separate bowl to help it all incorporate. It is creamy and delicious. Once the cream cheese has melted, you can mix it up really good, and top with bacon, cheese and green onions. It is AMAZING. The perfect dinner on a cold winer night. Not that it really gets all that cold here in Southern California. 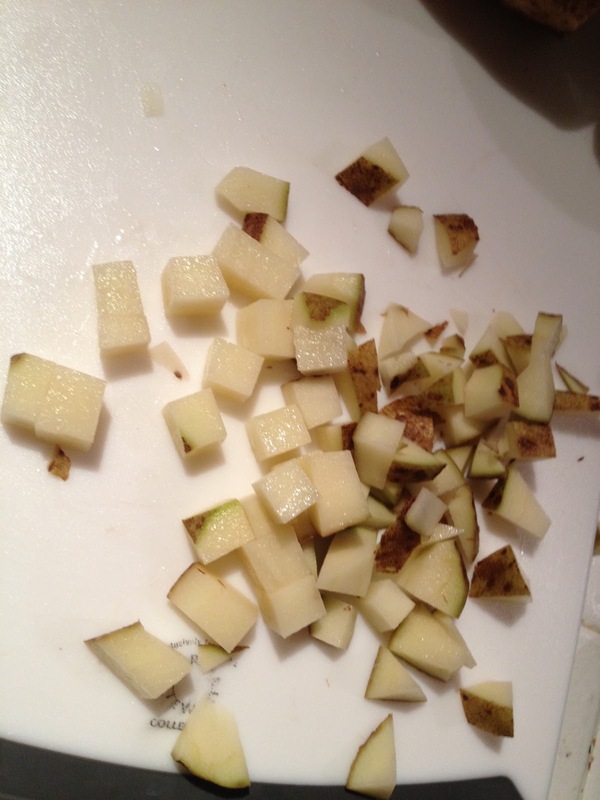 It seriously is totally worth the time it takes to chop up the potatoes and onion. Here is the full recipe for you to enjoy! Add potatoes, onion, garlic, seasoning and chicken stock to slow cooker. Cook on high for 6 hours. Remove and puree the garlic cloves along with 1/2 to 1/3rd of the soup, and then reintroduce to the remainder in the crock pot. Stir in the cream cheese and allow to melt. Stir until soup is well blended, you may have to wait 5-10 min in between stirring to allow the cream cheese to fully melt. Top with your choice of garnishes & enjoy! I had gotten some chicken on sale and just cut it up and threw it into the frying pan to cook it quick. It may not be the healthiest way to cook chicken, but its fast and easy. Then you chop up the tortillas into bite sized pieces. Repeat layers and top with the rest of the tortilla strips. The best thing about this recipe is you can make it all the night before (or morning before you go to work) and then just toss it in the oven when you are ready for dinner, which is what I usually do. I also usually add extra cheese into the soup mixture as I LOVE cheese! I hope that you enjoy, this, and if you are a "copy and paste" type person, just look below for the entirety of the recipe. Chop up the tortillas into bite sized pieces.